No one can deny that the holiday season brings sweet scents seeping out of the oven, accumulating shopping bags full of gifts for loved ones and Christmas decor dispersed throughout the house. I would be lying if I told you I did not absolutely love all of these aspects of this time of year but, the most memorable holiday moments to me embody two elements: generosity and friendship. I met Professor Juraj Kittler during the Fall of 2014 when I took my favorite class thus far at St. Lawrence University: Literary Journalism/Feature Writing. Throughout this course Juraj pushed me passed my comfort zone. He ingrained a level of confidence in me to interview individuals whom I initially deemed unreachable and he drove me to be even more self-critical of my own writing than I previously was by pushing me to dig for that one story yet to be discovered or directly call that MIT professor featured on Frontline and TED talks all over the internet. In no time, Juraj became a mentor, a close-friend, and one of my greatest supporters in not only my academic endeavors, but my well-being and future aspirations of becoming a journalist as well. You only come across a handful of individuals in your life that are as caring and welcoming as Juraj and his wife, Beth. 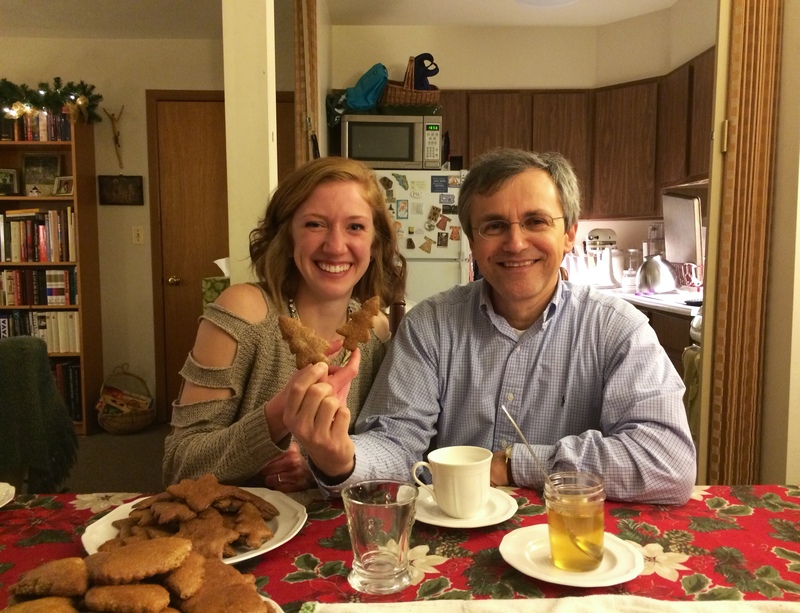 The first time I went to their apartment this past semester for a comforting home cooked meal, I had the privilege of meeting a beautiful new friend from Spain named Ana whom Juraj and Beth maintain a strong relationship with. Nothing (not even breakfast!) can beat the joy and excitement of building new friendships and getting to know people that step into your life in unforeseen ways. After hours of talking and sharing stories, I can say with certainty that this night, although it may have simply been a typical dinner for Juraj, Beth, and Ana, was one of the most memorable nights I had all semester. Endless hours of studying and re-writing sections of research papers prior to finals week can get a bit bothersome after a while to say the least. So, what better way to take a study break then to bake traditional Czechoslovakian cookies with Beth on her day off of work? 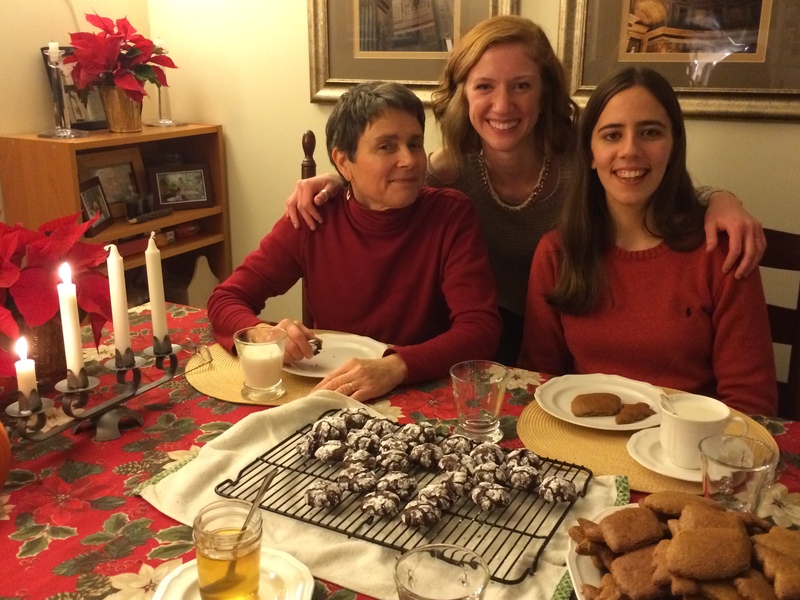 Beth, Ana, and I worked together to make dozens upon dozens of cookies in anticipation of the holiday season. I always enjoy trying out new cookie recipes. My mom makes over sixteen different kinds at Christmas time and mentioning a new kind always spurs her interest. The pernicky cookies contain multiple spices that truly make them a long-lasting, crisp, and tasteful treat to go along with a warm drink. Upon leaving Beth’s home, she handed me a packet of her special pernick mix and told me that I could only take it if I promised to make the traditional Czechoslovakian cookies at home. I assured her that I would and do not worry, I kept my promise! When I asked my grandmother if I could come over after Sunday mass to make the pernicky cookies together she immediately grew excited to try something new. 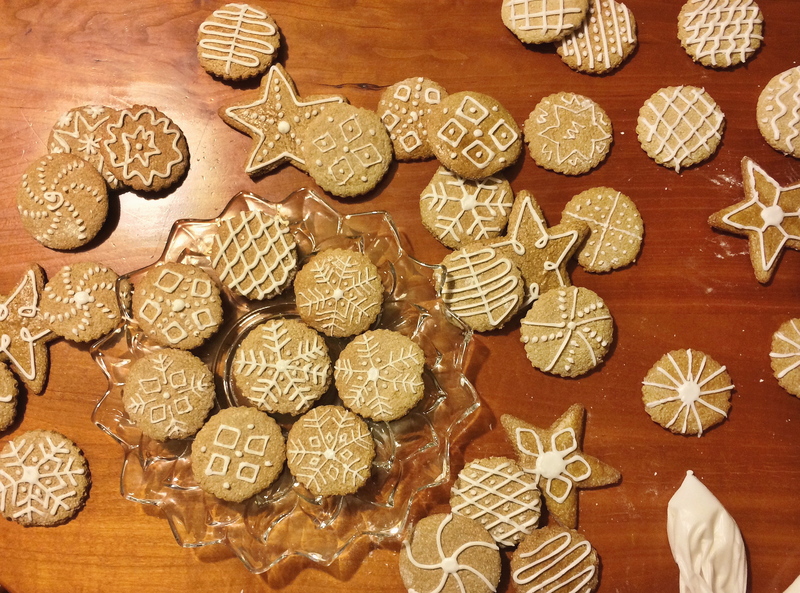 The best part about making these cookies the second time around was that I had time to frost them and create intricate designs with a simple white frosting. I love being creative in my decorating, especially when attempting to mimic my grandmother’s intricate Ukrainian decorating skills when it comes to embellishing hard boiled eggs with hot wax at Easter time. Beth’s generosity in giving me a packet of the pernick spices allowed me to share a memorable Sunday afternoon with my Grandmother and more importantly, embody the loving and caring friendship that she expresses every time I see her. If the hectic nature of the holiday season leaves you feeling rushed, panicked, and flustered, just remember one thing: take the time to thank friends such as Juraj and Beth who never think twice about opening their home and their hearts to others. And with that, I wish you all a very Merry Christmas and happy holiday season! In a mixing bowl blend honey, sugar, eggs, and pernik spice mix together until combined. In a separate bowl mix together baking soda, regular flour, and rye flour then add to other bowl. Mix thoroughly and mound into a ball to chill in the fridge for an hour. Preheat oven to 350 degrees F. Roll out the chilled dough thinly and use cookie cutters to cut into shapes. Grease baking sheets before placing cookies on them. Bake for 10-12 minutes. Let the cookies cool. Meanwhile, in a small bowl mix together confectioner’s sugar and water until you reach a frosting consistency that is thick enough that it will not run. Spoon the frosting into a ziploc bag, slightly cut the bottom corner of the bag and use it to decorate the cookies. Then grab a cup of coffee or hot cocoa and bon appétit! Next Post Who’s bready for next Christmas? !